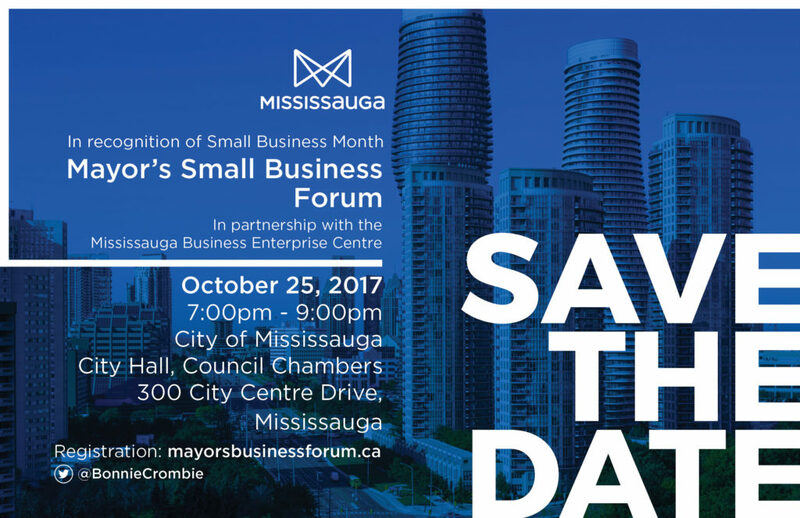 Mississauga – In celebration of Small Business Month, Mayor Crombie will be hosting a Mayor’s Small Business Forum in conjunction with the Mississauga Business Enterprise Centre (MBEC). The forum will be an opportunity for small business owners to discuss ways local government can further help local job creators compete, expand and succeed, Mayor Crombie said. The Mayor’s Small Business Forum will feature a panel of business and government representatives speaking about the programs and services available to support the small business community, followed by a question and answer period. “I invite and encourage all of Mississauga’s hardworking small business owners and entrepreneurs to take advantage of this opportunity to learn about local programs and services available to them and have their voices heard during these sessions,” Mayor Crombie said. “The team at the Mississauga Business Enterprise Centre (MBEC) is excited to be partner of the Mayor’s Small Business Forum during Small Business Month here in Mississauga. We know that entrepreneurs and small business owners need the right information and training to start and grow their business successfully. We are proud to provide programs and services like this to support our local small business community whose success stories inspire us each day,” added Heidi Brown, Manager of Small Business & Entrepreneurship at the City of Mississauga. Details of the forum are provided below. To register and for more information, please visit: mayorsbusinessforum.ca.